Leading Manufacturer of digital flow meter with totalizer, metal tube rotameter and metal tube rotameter with totalizer from Mumbai. It operates on the principle of variable area; the fluid in the metal tube raises the float in the taper tube increasing the area of passage of fluid. By a magnetic coupling the inner float movement through a series of linkages and counter weight. The tube and the float combination determines the flowrate. The inner float magnetic field is detected by the high sensitive magnetic field detection sensor ,enable us to show the digital readout. 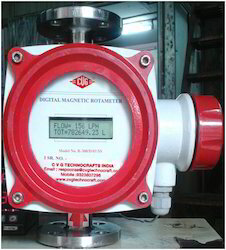 As such this flowmeter does not require any electrical connection, since it operates on battery. This got an inbuilt two wire transmitter just provide 24 vdc. And take 4 – 20 ma signal. local indication without the need for auxiliary power. Minimum pressure losses. Easy to read. Accurate measurement even at higher flow(150 m3/hr). Suitable for low flow (10 lph)default inbuilt transmitter of 4 – 20 ma (loop powered). No movement assembly reducing the maintenance. 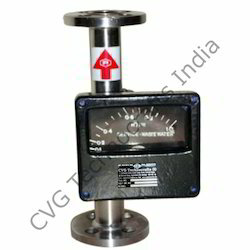 Clients can avail from us an extensive array of Metal Tube Rotameter. These metal tube rotameters are suitable for metering of translucent or opaque fluids under high operating pressure and temperature, we offer this metal tube rotameter in diverse modified options according to the customer’s requisites and supply it in given time frame. This metal tube rotameter is manufactured with top grade of unfinished material, procured from the authentic sources of the market. This metal tube rotameter is examined on provisions of quality before its final supply to the customers. 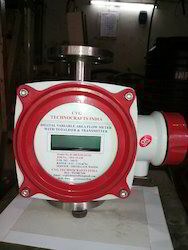 We are leading manufacturer of digital metal tube rotameter with transmitter and totalizer.